Julie Stock Introduces Her New Romance Novel And Shares The Decision That Changed Her Publishing Life. 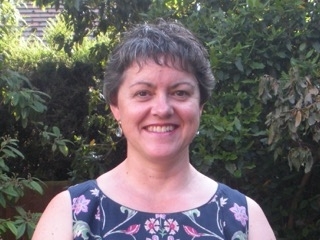 This week I am delighted to welcome my friend Julie Stock back to my blog. I am particularly pleased and honoured because she has made time in her Publication Week to come here for a chat. Julie is the a multi talented lady who works freelance as a writer, supply teacher and WordPress website designer and troubleshooter. Her latest novel, The Vineyard in Alsace, is published on March 6th. Julie, welcome back. It's a whole year since you were last here. Since then we met in real life at the RNA Conference last summer in Lancaster and spent ages nattering. Then in October, the two of us, plus Kate Field and Catherine Meadows, met up in Birmingham for lunch. One thing about writers - we'll travel long distances for friends and a good meal! I have to open this interview with congratulations on the publication of your second novel, The Vineyard in Alsace, on March 6th. Tell us a bit about it. Thanks, Sue. It’s been a very exciting and busy time pre-publication! 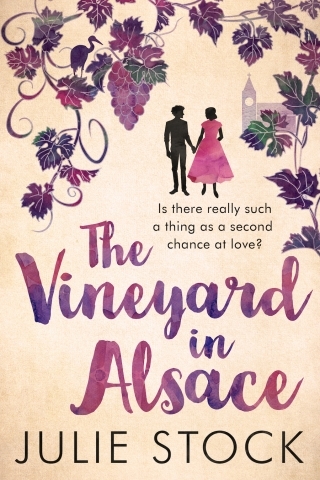 The Vineyard in Alsace tells the story of Fran and Didier, who were in love with each other at university but split up when she left for a job in London and he stayed behind to train as a vineyard manager. And you have another lovely cover. You have an eye for just the right cover illustration. ...and this new one is pretty and romantic. I am so pleased with my cover. This time, I worked with Rachel Lawston who has done a fabulous job in conveying the messages I wanted the cover to get across. It obviously conveys that it’s a romance, as you’ve said, and the vine illustration clearly shows that it’s set on a vineyard. The last piece in the puzzle was to give a suggestion of the location, which comes from the church and from the stork, the traditional symbol of Alsace, which is hidden among the vines. Sorry to interrupt, Julie - I have to stop you for a moment while I go and look for the stork. Found it! Overall though, it’s the combination of the colours and the beautiful illustrations that really make it such a success. The feedback I’ve had has been amazing! There's more to publication day than meets the eye, isn't there? I know 2016 was a difficult year for you, but you ended it by making decisions about your publishing life. Do you mind sharing the process you went through? Well, this book went through the RNA’s New Writers’ Scheme again and when I got it back in 2015, the feedback was very positive so I made a few changes and after a lot of thought, I decided to try submitting it to agents and publishers. I had some good feedback and I came very close to having it picked up by an agent but not quite close enough. So I decided to act on the feedback I’d received with the help of an editor. She acted like a mentor to me really and we worked together to do a structural edit on my book. I then met an agent and a publisher at the RNA Conference who had both read the newly edited first three chapters. One of them hated it and one of them loved it! Literally. What can I say? It was at this point that I started to wonder whether I was doing the right thing if their reactions were so diverse. Anyway, once the whole book was ready, I sent it out to two more publishers. One of them rejected it and the other didn’t ever get back to me. That’s when I realised that I had spent the best part of a year chasing this and all to no avail. When I considered all the things I’d been told along the way, things like ‘it needs to be much more commercial for us to take it’, as well as the disappointing stories I was hearing from some friends about their experience with their publishers, I knew I had to really think about what I wanted from my writing career. That’s when I decided to self-publish again. Having done it before, I knew what would be involved and I knew I could do it. It’s not easy and I’m not saying that I wouldn’t like to get the same sort of sales my friends with publishing contracts are getting but I think indie publishing just suits me and my writing better. Was there a single moment when it all fell into place? That moment at the Conference was telling for me but the publisher liked it so much, I thought it was worth another round of submissions to see what would happen. To be honest though, when it was rejected again, in a way I felt relieved because I was already thinking about self-publishing and the freedom it would give me to do my own thing and to be in control. I knew then that if I was relieved, not disappointed, I ought to go with my instinct and continue with self-publishing. And are you feeling settled now? Happy with the way ahead? Yes, I feel very happy with my decision and I’m looking forward to what the future may bring with the publication of this second book. And now that I’ve decided to continue pursuing the indie route, it has given me confidence and motivation to get on with things. I'm so pleased to know you feel like that. What lies ahead? The immediate future, I'm sure, includes lots of blogs, publicity and general celebration surrounding your new book. The immediate future is really busy, as you say, which is fantastic, if a bit scary! I am desperately trying to get going with my first draft of my third book to send it off to the New Writers’ Scheme this year. 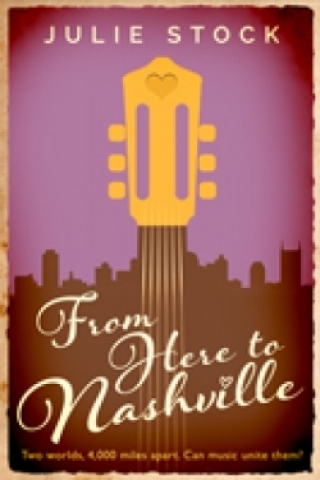 Then I am determined to edit my sequel novella to my first book, From Here to Nashville. To finish off, please tell us something about the story inside that attractive cover. Fran Schell has only just become engaged when she finds her fiance in bed with another woman. She knows this is the push she needs to break free from him and leave London. She applies for her dream job on a vineyard in Alsace in France, not far from her family home, determined to concentrate on her work. with Fran if only she will forgive him for not following her to London. Julie, it has been a pleasure having you here again for a good chat. Thanks for sharing your thoughts and experiences. You are always so honest about everything on your blog and in interviews and I'm sure that has helped other writers. Thanks very much for having me on your lovely blog again, Susanna. Your continued support means so much and I hope we’ll be able to meet up again in real life very soon over food and wine! I remember reading a blog of yours a couple of months back where you were really debating this and you sounded quite down, so it's so lovely to see that you've come through the other side, clear and positive. It's such a roller coaster and we can spend so much time submitting and tweaking and submitting again that we end up losing the precious writing time we have. Your book cover is gorgeous and the book sounds fabulous. I wish you every success with it. A very thought provoking blog. Congratulations Julie on your books and your tenacity too. It's not an easy journey is it? Hi, Julie. Nice to see you here again. I'm glad you enjoyed the interview and felt a connection with Julie's experiences. Hope you enjoy reading The Vineyard in Alsace. By the way, I loved your Facebook photos of the Sardine procession - so colourful. Great interview and I love the cover. I always like to find out about the author's journey and Julie has obviously worked hard to self publish. Honesty is very important to me too and I think one of the biggest drawbacks to trad publishing is the length of time it takes. Plus it is probably not for those of us at the control freak end of the spectrum! I've just bought the book and I'm looking forward to reading it. Good luck Julie - hope it goes well. I'm with Jen on this one. The thing that characterises all Julie's blog posts and interviews is her honesty. She never flinches from telling it as she sees it, even when it's uncomfortable, which gives her posts extra depth. Thanks for commenting, Jen. Glad you found the stork! I enjoyed this interview for many reasons but, perhaps most importantly, because you reflected so honestly on the ups and downs of the writing journey, and related career decisions, all writers face. I'm happy you've found the path that works for you both personally and professionally. You are indeed doing indie publishing the right way and for the right reasons. That's a first, Ros - I never thought of a book cover in terms of toning in with an author pic (though now you mention it, I can see what you mean!). Enjoy the book. Kate, what a lovely comment you left for Julie. I too am looking forward to reading The Vineyard in Alsace, but I'll have to wait a little longer than you, as I do like my paperbacks, so I have to await delivery of a different sort to yours. And I agree with what you say about Julie being such a supportive friend. She's a star. I have been out, taking the cat to the vet, and now I have come home to all these lovely comments on Julie's interview. Julie, I am so pleased that you have received such a warm and supportive response. Caroline, I loved reading your comment and Julie's reply. One feature of the writing profession that we can all be proud of is how very encouraging and helpful writers are towards one another, even on the shortest acquaintance, as your words and Julie's make very clear. I'm glad you enjoyed reading Julie's interview. Thanks so much for your lovely comment. It is hard to keep going through that constant round of submissions and rejections, and to keep picking yourself up and starting again. For me though, I suppose it was all part of working out what I wanted from my writing career and part of that is being in control of my own destiny. So something had to give. As you say, indie publishing has come a long way and is respected when done properly. Thanks for your good wishes. I love the idea that I have my own niche ;) Thanks for taking the time to read my interview with Susanna and for leaving a comment. Louise, it's lovely to hear from you again. Do you know, I had forgotten about vanity publishing until you mentioned it. You are right - vanity publishing and self-publishing are two vastly different things. Self-publishing has opened up all kinds of opportunities for writers. Thanks for sharing your thoughts. I'm not a writer, but reading your interview, Julie, made me understand what writers go through when they are trying to get their books taken on by agents and/or publishers. It must be so hard to keep going sometimes. Your interview also made me remember what used to be called vanity publishing, which people used to look down on because it meant that a book wasn't good enough to be published by a "real" publisher. Things are very different now and self-publishing is a perfectly valid thing to do. Good luck with your writing. You have obviously been on a long emotional journey as well as a professional one. I'm pleased for you for finding your own niche.